Removing grass from your yard gets to be a pattern after a while. With outdoor projects, it happens frequently, whether you are installing a front pathway, digging a garden pond, laying cable for landscape path lights, installing a fence, or just about anything else. Removing grass is to outdoor remodel projects is what priming is to painting: It's labor-intensive and not all that creative, but it's a necessary thing to do. But there is a grass removal routine that produces cleaner cuts, makes this heavy job less backbreaking, and smooths the transplant process. Having the correct tools such as a sod cutter and a sled takes you a long way toward successful completion. Due to the weight of the grass layer, it is best to have a carrying device that hugs low to the ground. Using a conventional wheelbarrow means lifting the sod an unnecessary foot or two, only to drop it a foot or two back to the ground. It is a time- and energy-wasting routine that you can eliminate with a ground-level, sliding device like a sled, contractor's bag, thick sheet plastic, or garbage can lid. A folding garden cart is the best of both worlds. This flexible device lays flat on the ground to allow you to tip the grass layer onto it. It then turns into a wheelbarrow so that you can wheel the grass layer away. Also, understand that you will be digging up complete layers of turf. You will not be removing just the grass but the attached dirt as well. If this sounds difficult, it is less difficult than you may imagine. It is far easier to pull out the grass with the underlying soil attached. In fact, the more dirt that is attached, the easier the project is. Generally, the entire thickness of the turf removed will be from 3 inches to 6 inches. With the sod cutter or spade, slice the grass into small sections that you will later be able to manage. If you intend to transplant the grass layers to another part of your yard, make the sections as large as you can move, but without hurting yourself. The suggested maximum size is about 18 inches by 18 inches. Larger sections are too difficult to manage; smaller sections do not transplant well. Place the end of the sod cutter or spade on the intended cut point. Tilt the tool forward, away from your body, until it is vertical. Push down with one foot. If the tool does not depress far, step on it with both feet. After making the vertical slices, place the blade in the cut that borders the rest of the lawn. Tilt the tool away from you so that it acts as a lever to force the sod to tilt up. 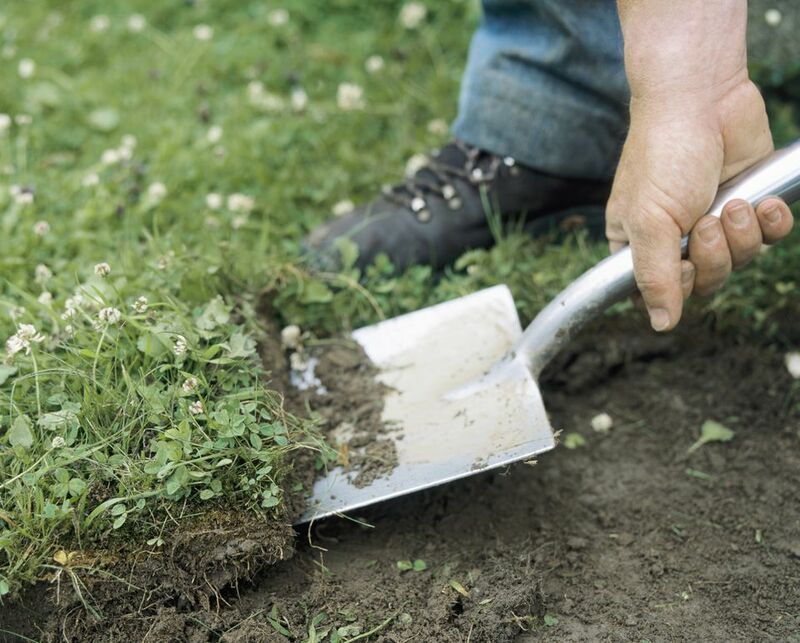 With the chunk of grass on end, use the trowel as a knife to scrape off excess soil at the bottom of the sod. If you are using a rigid device such as a sled, tilt the device to the side to match the angle of the grass layer. Let the sod and sled slowly tilt down flat again. This avoids breaking up the sod layer and reduces mess. If you are using a flexible device such as a contractor's bag, gently let the grass layer tilt down until flat on the bag. Next, slide the grass layer to the transplant location. If you wish to be precise about the size of the pieces, mark out a gridwork on the grass with marking paint or twine. Avoid slicing too far in advance as the slice marks often become obliterated and difficult to locate (unless marked off in advance). Remove grass no less than several days after rain or irrigation. Water-logged grass and its dirt substrate are far heavier to move when wet than when dry. Set up a side area covered in sheet plastic for knocking off the excess with the trowel. Knocking off this dirt on the rest of the lawn may ruin the lawn.